I was updating the section on Making Homemade Baby Formula tonight, when I realized I still have a few secrets I haven’t shared with you over the years. I know it’s hard to believe but it’s true. Last year, the whole household came down with the flu. I was passing out vitamins, liquid supplements and cough syrup at the speed of light. If you’ve ever tried giving kids their medicine, you know how much fun it is to clean out those measuring scoops. Forget about those plastic cups too. They are made of cheap plastic — you can never be sure they are really clean. Well, I found the perfect solution, I use these terrific little measuring cups for everything. Yes, we’ve broken a few of the larger (5 oz.) cups but the smaller shot glass size are very sturdy — I keep at least four on-hand. The entire family uses them. Apparently, they are becoming quite popular, because each time I check there are more selections available. I can hardly wait to buy a couple more. 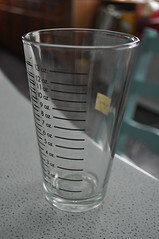 These measuring cups are perfect for measuring medicine, liquid supplements, measuring seasonings, converting recipes and I am sure I’ve forgotten a few other uses. I even have a heavyweight plastic cup with feet, for the little ones. I just found this measuring cup for those larger jobs. It appears to have a measure for every thing imaginable. Grandma always said it was important to have the right tool for the job and she was right. I find myself using these cute little glasses almost everytime I use the kitchen. I know when I purchase new kitchen items, I always wonder, “How often will I really use this item?” When I bought my new Vollrath (Tribute) cookware, I was thrilled with every piece. Even today, it feels good to cook with these terrific pans. I am no less enthusiastic about these measuring cups. Today is my day to rant! My entire family has been sick with some sort of bug or flu for the past three-months. At least one of us, if not every one of us has been constantly or chronically ill during that time. What a miserable existence. I feel as though I’ve let my family down and that our illnesses somehow reflect on me. I try my best to clean up messes as they arise, keep the laundry under control, along with the bedding changes — I admit I’m a little lax in the vacuuming department but we aren’t eating off the floors — they can wait. I have been doing the bare minimum amount of work and I can’t think clearly enough to work on a paying project, my head is simply in a fog. I haven’t even blogged because being raised in a "southern home" (Ohio), my grammar is — well — southernized. I mean let’s face it; if you can understand a southerner (and you’re not from the south), you are doing pretty darn well. I wouldn’t really call Ohio part of the deep south but you’d never know it from talking with them. My point is that I have trouble writing proper sentences when I’m up to par, why risk looking unprofessional and illiterate if I don’t have to expose myself — especially when I’m sick? But what fun is that I ask you? I enjoy posting about our daily happenings and ranting about whatever topic just drops in my lap for the day. I started one piece during my first bought with the flu bug about my very first brand new computer — well my very first one that I actually get to keep. The first two machines Shawn ordered (both HP’s) were sent back due to one problem or another. This new Alienware computer is the icing on the cake — it’s just that sweet. The article still needs a great deal of work. Another article I started was about my last trip to The Biggest Little Kitchen Store located in Jackson, Ca. I think it’s my favorite place on earth. If I could die and go to kitchen heaven, that would be it. Shhh, don’t tell Janie. What do you think? Do you enjoy reading sloppy blogs or should they be top-notch every time?